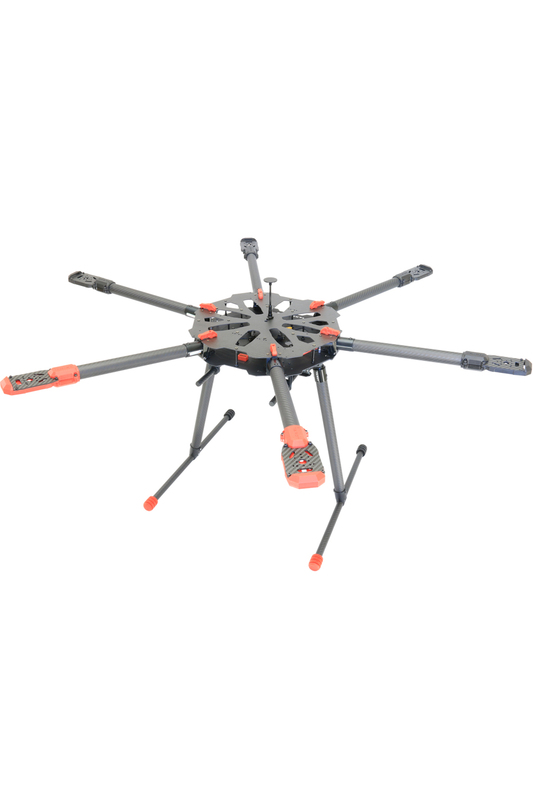 The Tarot X6 Airframe was designed to meet the specific needs of professional operators seeking a heavy-lift videography platform. The X6 has unique features that set it apart from similar multi-rotor platforms such as folding arms that can locked into position in a matter of seconds allowing for easy transport or storage, heavy lift capability and ruggedized landing rear to name but a few. Without question the Tarot X6 was designed to be a workhorse. The Tarot X6 is ideal for high end camera gimbals and professional videography equipment (3-Axis Gimbal and DSLR Camera) with an integrated PCB board for easy cabling, foldable arms for easy transportation (no tools required) and servoless landing gear to give your camera and unimpeded 360 degree view of the world. The battery placement on the X6 keeps the centre of gravity low which is conducive to stable flight, coupled with the ability to re-position your camera gimbal will allow you to fine tune your platform for ideal weight distribution. The frame utilises a proprietary power distribution system for your ESC’s and also includes 3 x XT60 connectors for auxiliary items. Please advise what is supplied with this frame kit? i.e. hanging tubes & brackets, battery plate and also esc wiring hub, etc.? Hi Dave, thanks for your question. Everything you see in the photographs is included in the kit. So loading rails, battery plate, retractable landing gear, ESC wiring hub and wiring (signal wires and ESC power cables) are all included. I sell a metal motor mount upgrade and a canopy for it separately. Yes, I still have them in stock, just so you know the sale price will end before the new year. I think your setup will add up to more than 2kg, but if you keep the weight down, I would opt for the Tarot 4008 motors and the 1355 props.